We had our first frost the second week of October. 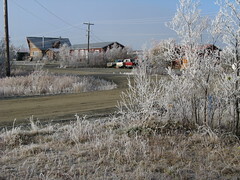 The thick frost of the tundra is beautiful. With the noticeably shorter day’s the frost takes longer to thaw. This is a picture I took when I came home at noon. It started to thaw just about 1:00. The berry picking season is definitely over now.